Choosing a Wipes warmer wasn't easy at all. I didn't think it would actually take me time to figure out what I needed for my baby. And it really tore me when I had to choose whether I should just go for price or just swing it and make an investment and hope that I won't regret my decision for an expensive one. Anyway, I don't want you to suffer as I did so let me give you a hand in making your online choice much easier. Your budget is definitely something you'd prioritize in practically purchasing anything. So from $20 to $50, there is a big difference in the prices from one brand to another. And this is a really big factor. Aside from the initial price, we also have to consider the cost of ownership. Is it cheap to maintain? Does it consume a lot of electricity since it has to be plugged in all the time? And we also have to consider if the price is worth it. Heating is definitively something that needs to be considered since it is its main feature. Some of the wipes warmers in the market can burn and dry out wipes instead of actually just warming it up. We wouldn't want that at all. Wipes warmers should only warm up baby wipes and not steam it - just lukewarm and comfortable enough to use on our little ones. We also need a warmer that warms all the wipes inside and not just the top ones. We don't want to run out of wipes mid-way of us changing our baby's diapers, would we? Capacity is important because a huge space for more wipes means we don't have to keep topping up the warmer and also preventing us from reaching out for those cold packs of wipes when we run out. One feature that is common in almost all wipes warmers is all about lighting. Night time diaper changes become very convenient when we have a source of light that provides good vision at night without having to turn on a lamp, the nursery light, or any other light source. We need something that will also add on to a comfortable night change without having to wake up or disturb our little one in their sleep. This is vital. Great wipes warmers have to be versatile and not sensitive to only brand wipes that will only fit the wipes warmer. A wipes warmer would be best if it can come to accommodate different brands of wipes as well, since not all wet wipes brands don't follow the same size and thickness. Energy efficient and superbly neat. It heats the wipes from top to bottom providing us with readily warm wipes every single time you dispense one. It has a tight rubber lip that keeps the wipes in place allowing you to dispense one wipe at a time. It is also low-cost and low-maintenance. It consumes very little electricity and comes with a night light as well. The night light features a gentle night glow in the dark. It is dim enough not to bother your little one in her sleep but it is also bright enough to see where stuff is. You can turn on the light and it will automatically shut-off after 10 minutes so that's ample time to actually change your baby's diapers. The wipes warmer can hold up to 100 baby wipes. It is also capable of being able to accommodate different types of baby wipes. It has a clear view as well to show you just how much wipes is left. It's very convenient since it lets you know how much is left and when to add some more. It can also accommodate cloth wipes if that's what you use. Removing that jolt off the cold wipes is something you will be assured of with hiccapop. It's great that it also has good heating and heats up from the top. However, the heating can go too hot that it dries up the top of the wipes, so you might want to add a little bit of water in it to keep the wipes moist. The warmer has a huge capacity holding up to 75 wipes at a time. It's great that it also has a clear view that allows you to see how much wipes are left. It lets you know that you need to fill it up some more before you run out. The night light is pretty bright though and serves well as a good lamp in changing diapers in the middle of the night. What's also great about it is that it also shuts off after ten minutes. You can easily turn the light on again if you need more than 10 minutes to change diapers and put your little one back to sleep. It is also low-voltage keeping up with great cost of ownership overall. It is also very easy to clean. This wipes warmer really does stand out. It is the only one in our list - and the only one I found to be anti-microbial. This is perfect especially for moms who use cloth wipes as well. This is great since the warmer has an EPA-approved anti-microbial additive that prevents bacteria from breeding inside the warmer. That is also convenient because you'll have to worry less about constantly cleaning it to prevent the wipes from molding up and becoming a house filled with bacteria. It also features its patented Ever-Fresh Pillow System keeping all the wipes inside to stay warm and moist. It doesn't dry up any of your wipes and it doesn't allow your wipes from going brown and burnt either. 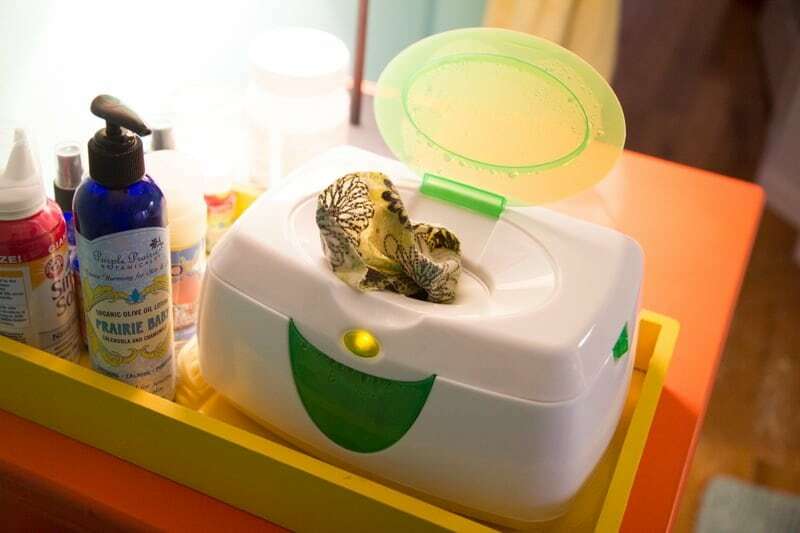 The ever-fresh system features an evaporation-condensation cycle that eventually returns the clean water back into the wipes rather than you adding water into it to keep the wipes warm. It also has a glowing light, allowing you to change your baby's diapers even way into the night. The gentle glow also serves as a gentle night light for your little one when sleeping. It also has great capacity holding about 80-100 disposable wipes and about 16-10 cloth wipes. Simple and efficient. These are the two best words to describe this wipe warmer. It has a very simple design and also provides good quality heating as well. However, heating can also dry out the wipes inside making it very inconvenient. You need to add water to it to keep the moist. It has great capacity holding about 80 wipes and keeping them all warm. You won't find an issue with it ever being cold in the middle and down at the bottom but it evenly warms up all of the wipes inside. It also comes with a convenient night light. Once you open the lid to pull off some wipes, the light automatically turns on. As long as the lid of the dispenser is open, the night comes on as well. This is preferable for all moms especially at night since you don't really need to wait for the light to come off automatically. It may be great at keeping the wipes warm but it is pretty expensive. The cost is way over the expected quality. The Lil' Jumbl Gentle heating provides great comfort in only warming up the wipes inside. It doesn't brown or burn the wipes, however, with gentle heating the wipes only go warm all the way until the middle. It also has a small clear view to see how much wipes are left inside. It can also hold up to 80 disposable wipes at a time. However, the warmer is a bit short and it is a bit difficult to fit in longer wipes but you can still put it in, however, it won't maximize the capacity. It is great that it is also battery powered, unlike most wipes warmers, it allows you to travel around with it when traveling. It is pretty bulky though making it a bit difficult to pack and it kind of leaks too. It also has 2 heat settings. It allows you to choose a warmer heating or just breaking the cold off the wipes. The warmer setting is perfect for winter as well. ​Choosing the best wipe warmer had been difficult with so many choices but narrowing the list down was pretty easy. It is for the benefit of your little one to have a comfortable diaper change and also for you to easily put your baby back to sleep during night time diaper changes. ​Our top pick is definitely the Prince LionHeart Ultimate Wipes Warmer. Although it doesn't have an automatic light shut-off and doesn't have a clear view, the pros definitely outweigh the cons. And it features more mom-preferred features that no other wipe warmers can. ​Munc﻿﻿hki﻿﻿n comes in second with great ease-of-use and automatic light shut-off, however, its features are practically the same with the hiccapop wipe warmer. ​Anyway, whichever you pick, we are sure you won't regret your choice. And whatever is best for your baby is definitely whatever is best for you too.